“The more a diamond is cut……. I accept no credit for originality with this one. It is something I read in a teeny tiny book I have in the Hazelden Meditations Series, “Today’s Gift”. With no matter what you have going on in any area of your life, may you find a little peace in knowing that your being “polished “. There is something of value to be found even in the worst of things. Consider an oyster. When a grain of sand penetrates an oyster shell. It irritates the oyster, making it uncomfortable. The oyster relieves the pain by coating the grain of sand with a soothing liquid. When this liquid hardens, a pearl is formed. The very process that healed the oyster created a precious jewel for others to cherish and admire. The way in which we deal with our own frustrations – painful though they may be – can make a difference. Pearls can be formed from our experiences, making us wiser and stronger, or grains of sand – bitterness, anger, resentment – can be imbedded inside us. The choice is ours. 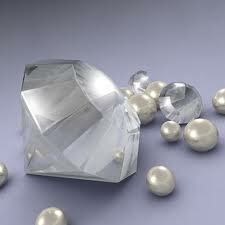 How can I turn my irritations into pearls today?